Happy Friday!! It's been a great, but long week and I'm ready for the weekend, how about you? Well how about some crafty time - have anything planned? I carved out a bit of time this week to play with some new goodies I got from eclectic Paperie. Most people know I'm not much of a technique or distress stamper - I totally shy away from things that require lots of layers or inks. But I have been having fun giving some new-to-me products a try! 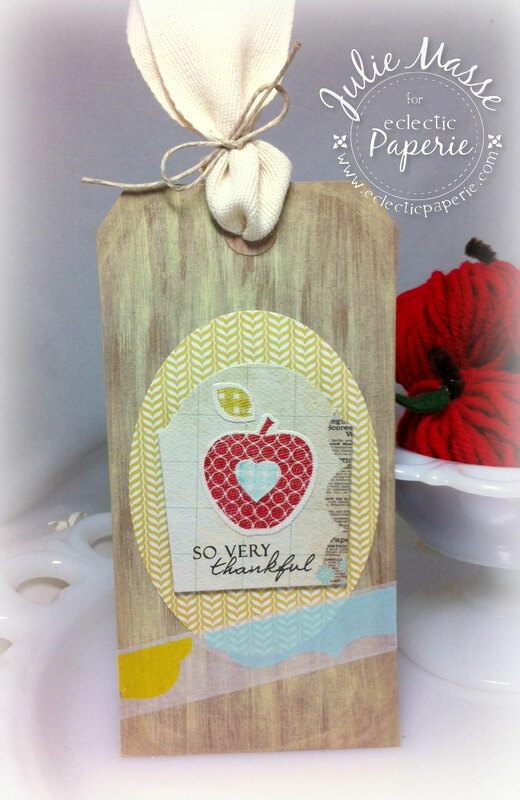 I think these awesome Kraft Tags from Inkssentials are so much fun, a nice big canvas to start with. I started by using a Ranger Paint Dabber in Lemonade to distress my tag - streaking it up and down to sort of simulate wood. I then sponged the edges with Frayed Burlap Distress Ink. The papers (Bluebell) and washi tape (Smile) was from My Mind's Eye - love the colors in this collection! The apple was die cut (using the Wplus9 matching Apple die) from an Inkssential Sticky Back Canvas ATC - great texture and it took ink beautifully!! Attach this baby to a bag of apples or a nice homemade apple pie - viola, instant present! Be sure to sign up for the eP newsletter (it's on the bottom left of the webpage) so that you can stay on top of what's new and all the great deals! Hope you have a fantastic Friday! Love this, especially the faux wood grain. Fabulous!